Magical Hat no Buttobi Turbo! 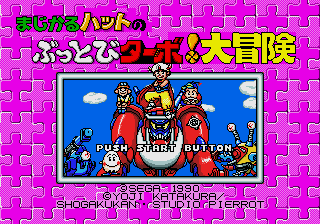 Daibouken (まじかるハットのぶっとびターボ！大冒険) is a 1990 game for the Sega Mega Drive developed by VIC Tokai and published by Sega to tie into Studio Pierrot's Magical Hat anime series. While this game was never released outside Japan, its story, graphics, level layouts, and music were changed into those of Decap Attack. crouches. punches. jumps. You can jump on enemies to temporarily stun them or multiple times to destroy them; punching will always destroy enemies. You can punch while in mid-air, but not while crouching. opens an inventory window where you can select items to use, such as better attacks. Main article: Magical Hat no Buttobi Turbo! Daibouken/Magazine articles.